A camp is, as you probably know, a place where people sleep temporarily. The tents or shelters they sleep in and also the people themselves can be called a camp. Figuratively, people who share beliefs or ideals can be called a camp as well. 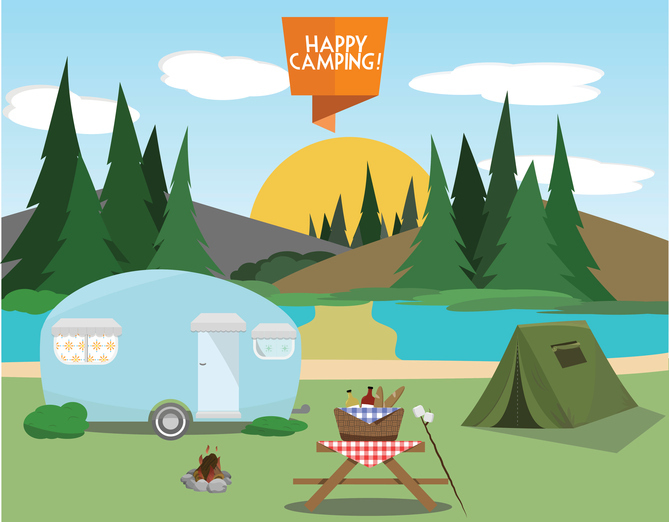 In US English, a camp is also a recreational area where children go to spend some of their summer vacations. As a verb, to camp means ‘to establish a camp.’ Unrelatedly, camp is something exaggerated or overly theatrical. The adjective camp describes these kinds of things. The soldiers headed back to camp. At the end of the vacation, the group dismantled the camp. The whole camp was awoken by the noise of the siren. Are you in the vegetarian camp or the meat-eating camp? The kids are spending a few weeks at camp. We're camping in the woods tonight. The movie was high camp from beginning to end. The actor's camp mannerisms made the audience laugh. As an adjective, camp is often used to describe behavior in men that is considered effeminate and, therefore, to describe the behavior of gay men in particular. When used in this way, it is often considered pejorative and offensive. Many American children spend their summers at camp. When they are younger, they usually go to day camp, which goes from about 8am to 3pm, just like normal school. Starting when kids are around 12, they often go to sleepaway (or sleepover) camp. These camps are usually in the country, often far away from family, and kids usually sleep in bunk beds. Usually teenagers called counselors are in charge of groups of children or younger teenagers at camps. Camp, which originally meant ‘the place where an army lodges temporarily,’ dates back to the early 16th century, and comes from the French camp, which can be traced, through the Italian campo, to the Latin campus (an open field or level space, especially for use in a military exercise). However, this is the second time the word made its way into English. Earlier, West Germanic had borrowed the Latin word as kampo-z, which made its way into Old English as camp, meaning (back then), ‘contest, battle, fight or war.’ This meaning was obsolete by the 15th century, though it has left its mark on some figurative senses, such as ‘adherents of a cause or doctrine,’ from the mid-19th century. The verb, meaning ‘to encamp,’ comes from the noun and dates back to the mid-16th century. The US meaning related to summer vacations is from the 19th century. The unrelated adjective, meaning ‘exaggerated or theatrical’ originally meant ‘tasteless,’ and appeared in the early 20th century as gay slang. It is probably from the French camper (to portray or pose), and was popularized by Susan Sontag in the 1960s, with the wider meaning we recognize today.